The Buddha was born under a tree, got enlightenment under a tree, and passed away under a tree. So, when Japanese architect Kenzō Tange drew up a master plan to develop Lumbini in 1978, he left 60% of the project area as a primeval jungle that has been more or less intact since the Buddha was born here. But the nativity site is now turning into a Buddhist Disneyland, with huge concrete structures popping up everywhere as countries in the region vie to build more majestic shrines. There are already 32 monasteries and temples within the core area of Lumbini, and 58 hotels outside it. Several Buddhist countries and institutes are pressing the Nepal government for permission to build more concrete structures within the core area. 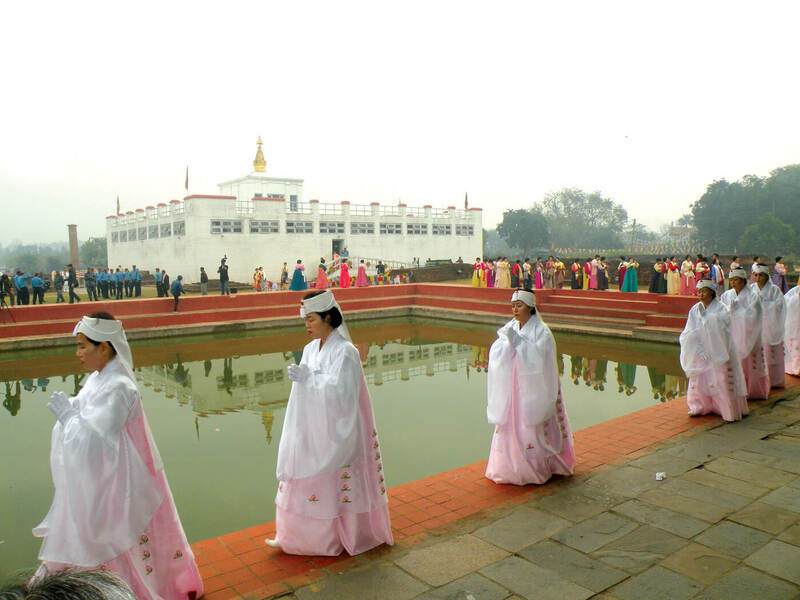 Last year, over 1.5 million pilgrims and tourists visited Lumbini from all over the world, a 20% increase from the previous year. This year, the number is expected to exceed the 2017 figures. And after the new Bhairawa airport (named Gautam Buddha International Airport) is ready by end 2019, the number is expected to shoot up even more, and reach 3.5 million by 2025, and 10 million by 2050. How will Lumbini’s spiritual and environmental importance survive this onslaught? 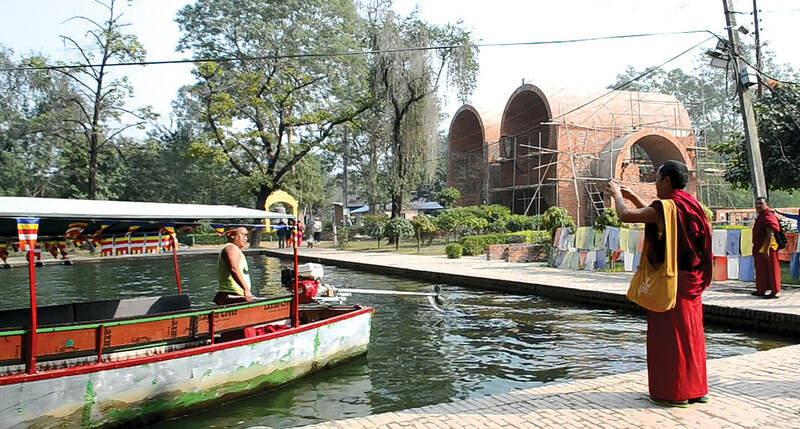 The government and local businesses see the rapidly growing number of pilgrims and tourists as a bonanza, but for those trying to preserve Lumbini’s tranquility, nature and the essential philosophy of Buddhism, it is already becoming a difficult task. 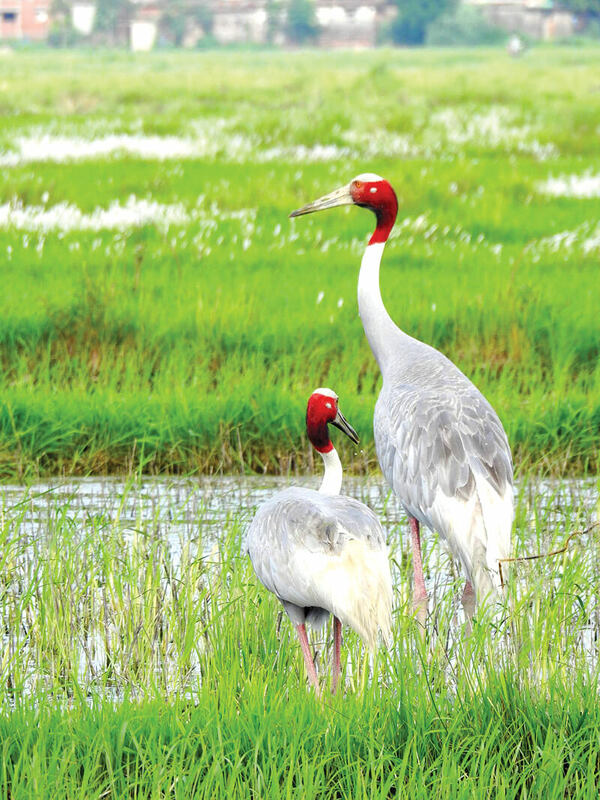 A case in point is the attempt to save Lumbini’s forests, wetlands and precious species like the Sarus cranes that live there. The tallest flying bird in the world has a deep meaning for Buddhists because of the belief that the Buddha himself saved a crane that had been wounded by an arrow shot by his cousin. Sarus cranes have lived in the fields around Lumbini since the time Buddha was young. Though crane numbers are dwindling, they still nest in the area today along with many other wildlife species. 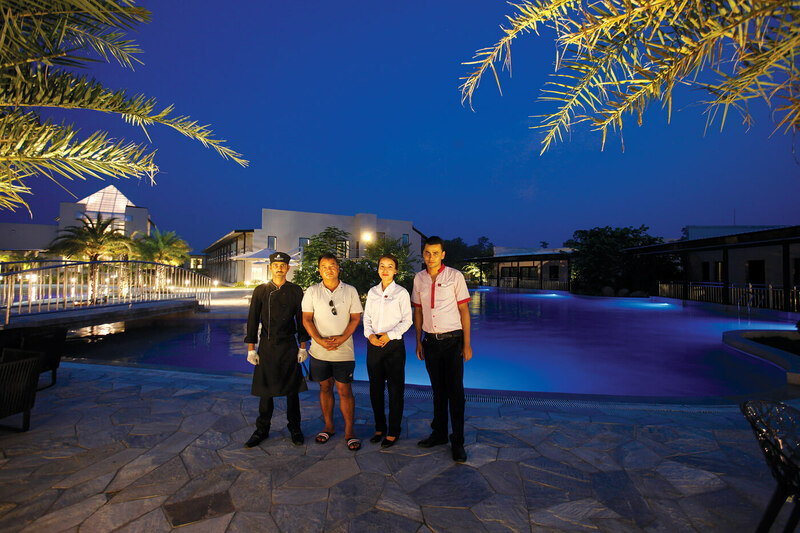 A proposal to build luxury hotels in the last remaining wetlands of Lumbini have threatened Sarus cranes, which have a deep meaning for Buddhists. The previous executive committee of Lumbini Development Trust (LDT) had given a green light to build four luxury hotels and a five-star meditation centre inside a 256-acre Sarus crane sanctuary, threatening the majestic low-flying birds that have lived here for nearly three millennia. When Venerable Metteyya, a 32-year-old Buddhist monk committed to protecting Sarus cranes, was appointed to head the LDT in 2017, he threw out the hotel proposal that would have destroyed the cranes’ wetland habitat. But he says the threat to the wetlands of Lumbini, the habitat of Sarus cranes and other species, is still there. Metteyya was ousted from the LDT after KP Oli became Prime Minister for the simple reason that he was appointed by the previous government, but he fought his way back into office by filing a petition at the Supreme Court. He says he will not allow any business group to destroy the crane sanctuary as long as he is in office. “The Sarus cranes will remain under threat unless the government realises that Lumbini is not just for humans but for all species,” the monk told us. Metteyya has introduced a phased Lumbini Conservation Project to preserve greenery and sanctity of the Buddha’s birthplace. In the first phase, the Sarus sanctuary will be developed into a nature centre in collaboration with International Crane Foundation. George Archibald of the Foundation visited Lumbini this week, and he is mentoring the project. 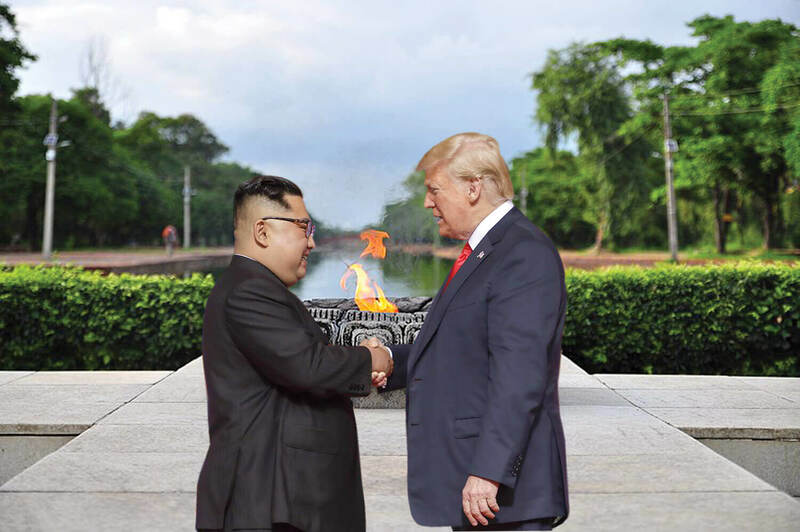 In the second phase, the area envisioned by Kenzō Tange as a lush and green jungle will be restored as Lumbini Ban (forest) and the third phase will start cleaning up industries and making Lumbini pollution-free.